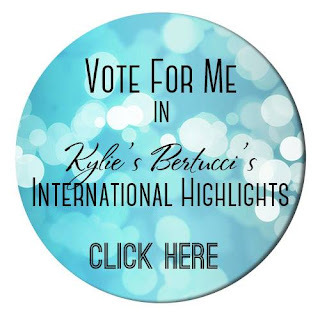 Thanks for coming to the International Blog Highlight today, hosted by the lovely Kylie Bertucci. You are currently visiting Jessie Holton in Australia.The top ten winners of this Blog Hop will get to be part of a special international blog hop so please vote for my project, as I would love to be able to participate in it! We have a wedding theme for this highlight. Do you ever buy a stamp set cos you love what you've seen someone else do with it? I fell in love with the little gift bag they made up for the photo for the Special Reason/Stylish Stems Bundle in the Occasions catalog & I've used it a few times since I got it but I just wasn't getting that feeling with it. So I decided to case the catalog & BAM! I'm in love again! Casing is a great way to get out of a ditch in your mojo! I've used Pear Pizazz, Calypso Coral & So Saffron to create this card, stamping off the inks & creating an ombre look on the flowers by inking up with So Saffron & then applying Calypso Coral to the outsides with a sponge. These three colours are really effective on the Kraft cardstock base. Can you believe this is the first time I've used the Hexagon embossing folder? Oh my! I love it! I've also added some of the white ribbon from the Sending Love Combo & some Basic Pearls. I've stamped the inside to match & added a few more pearls, as well.